A Professional Employer Organization, also known as a PEO or employee leasing company, provides small and midsize electrical businesses with a wide range of human resources-related services. The PEO handles all payroll administration and employee benefits, which frees the business owner up to focus on growing and maintaining his/her core business. 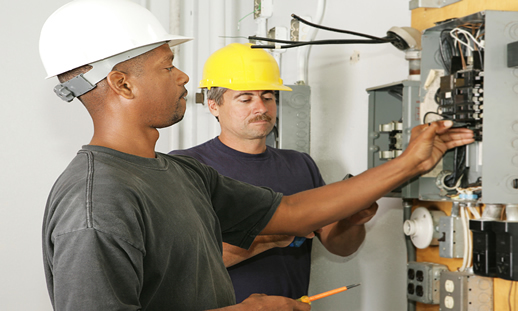 Why Do Electricians Use PEO Services? One of the best reasons to use a PEO provider is that they dramatically decrease your administrative tasks so you can focus on business growth. Electricians who use outsourcing don't have to spend time working on employment related paperwork such as payroll and benefits administration because the PEO manages these issues. A PEO arrangement is also called co-employment. This unique situation allows electrical contractors to outsource all liabilities and HR management, while still maintaining the day-to-day control of their employees. The business owner never loses control over his/her business and retains the ability to hire, fire, train, reprimand and schedule their employees. The PEO becomes the employer of record for tax purposes and is responsible for all of the HR-related tasks, such as paying the employees and providing the benefits. Workers' compensation insurance is many times the biggest costs associated with owning a business, so it's not surprising many employers are turning to PEOs to lower their costs. Employee leasing organizations negotiate competitive programs with insurance providers, which can often save employers up to 40% off the state rates for work comp. In addition to drastically reducing their rates, electricians also use PEOs to make sure that their employees are properly classified under the correct work comp code to avoid audits and possibly save even more. PEOs offer a payment service to help employers avoid large up-front payments while improving their cash flow. Employee Leasing Quotes began our mission to help employers in 2001, so we understand the differences between each employee leasing and PEO company and how they work. Not every one can provide the services and programs your unique business needs. We save you the time and effort from interviewing multiple PEO companies to find the one that works for you. We work with dozens of these HR outsourcing companies, so we can be objective and work for your best interests in the transaction. And most importantly, we use our negotiation power and leverage to ensure you get the best PEO at the best possible price. Getting started is easy. Just give us a call, ask questions, get quotes and see how these services could impact your electrical business today.